Sadly I already have a similar set up but the leak comes from the threads that the first piece goes into. Here’s a picture of the original damage, and then the leak even after the repair. How did you repair that crack? Well it took a while to find the right person. No shops in town wanted to touch it. My mechanic asked his friend who builds turbos for bikes and cars and does a lot of aluminum welding if he would look at my bike. This guy ended up welding it and rethreading the drain hole. He had a whole process and it was very cool. Apparently aluminum is really difficult to weld because it flexes or something, so I felt good that this guy was so confident about it. I was seriously thinking that I would either have to sell the bike for parts or find a new motor...neither of which I wanted to do. So, in the big picture, a small oil leak is something I have learned to live with. I’m also in grad school and my bike is my commuter (50 miles per day), so I can’t really afford to get a new bike right now. Did you put a new crush washer on the drain plug? 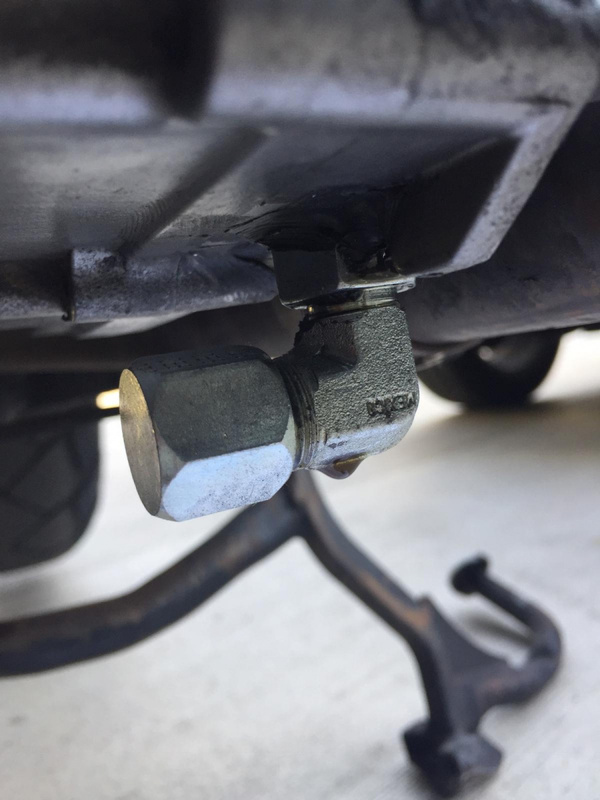 The bolt will leak without a crush washer or a bad one. 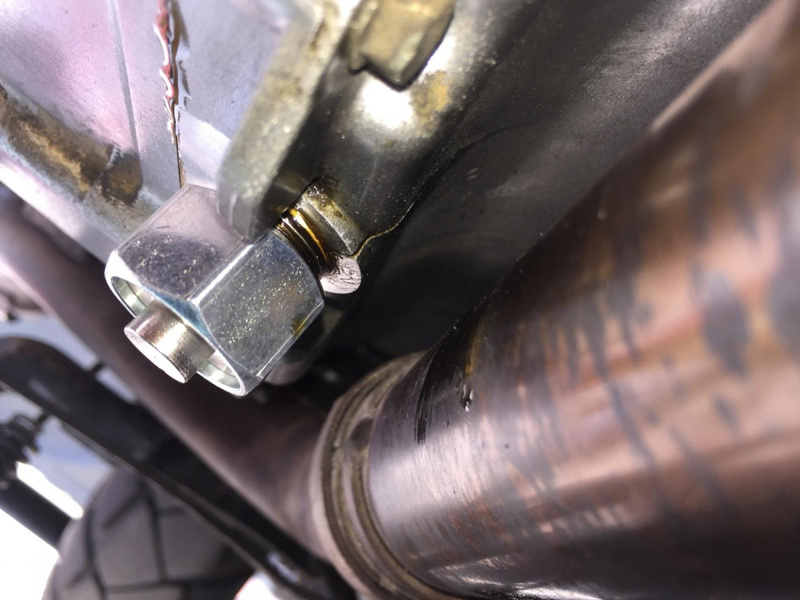 If the bolt still leaks with a new washer, my guess is the thread may have been cut on a slight angle, or possibly the crack was not fully welded. You could leave it as is. It takes many drops of oil to fill a thimble. Alternatively, use WD40 and a rag to clean the area and lie on the deck to watch the plug and see exactly where the leak is. Your engineer had a good idea in fitting the 90 degree fitting to avoid the need to reseal the plug every time you did an oil change. Perhaps he might have another go if you could positively identify where the leak is. Best done when the oil is hot and therefore flows easier. I haven't tried it. Worth a go as an alternative to starting over? Positive vibes are a cure for anything, man. Ride on.